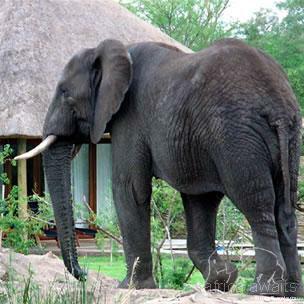 Savanna Private Game Reserve is situated in the world reknowned Sabi Sand Game Reserve. Memorable and exciting big game viewing and a fascinating insight into the local tribal customs of the Shangaan people, will form part of your safari experience. Savanna encompasses the very essence of an Out of Africa camp. 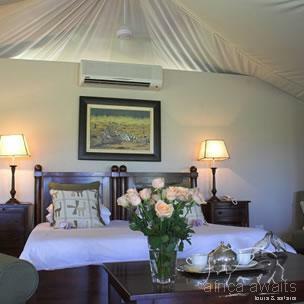 The Executive and Luxury tented suites combine the romance of a tented roof, with the sophistication of a permanent structure that ensures luxury and privacy. The Savanna Suite is a traditional thatch roofed building designed to offer high levels of elegance and comfort. Four Luxury Suites - en suite, with tented roofs, Fully stocked mini bar and tea/coffee station, Telephone in the bedroom, Built in Electronic Safes, Private verandah, Outdoor Shower, Air conditioned. Three Executive Suites - en suite with tented roofs, Bathroom has a large bath and double shower, Fully stocked mini bar and tea/coffee station, Wooden deck and private plunge pool, Large bedroom with lounge area, Mosquito Nets in the bedroom, Telephone in the bedroom, Built in Electronic Safes, Outdoor shower, Air conditioned. Savanna Suite - Comprises two separate, en suite bedrooms, separated by a large lounge and dining room, all under thatch - the three rooms are linked by corridors which makes the Savanna Suite ideal for families. The Savanna Suite can also be booked as two separate Suites, in which case it would not include the lounge, private landrover and private dining option. Air conditioned. Built in Electronic safes in the two bedrooms, Telephone in both bedrooms and the lounge, Fully stocked mini bar, Tea/coffee station in both bedrooms. Bathroom has a large bath and double shower, Outdoor shower. Each bedroom has a wooden deck and private plunge pool - the lounge has a covered verandah. New specially designed tables and chairs add to the ambiance of a starlit evening around the camp fire. Indulge in a relaxing and rejuvenating treatment in the privacy of your suite. All treatments are done by a qualified therapist and Masseuse. 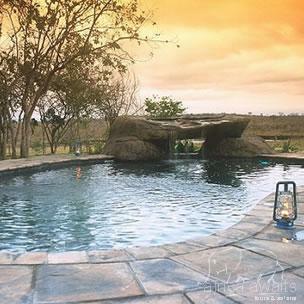 With your holiday, safari or business trip from in to Savanna Tented Camp in Kruger National Park.